That’s all the scans for today. I’ve a couple of other things to mention while I’m posting. I thought it might never happen but Replacementdocs has started to approve some of my submissions presumably thanks to the new editor Pelleas. I never intended to host them all myself so assuming this continues, I’ll be removing them from this site as they are approved from now on. If you want them in high quality, grab them now. I’m long overdue for some more gameplays and have decided I’d like to take a look at alternative versions of some of Origin’s classics. I’ve been adding some of these to the collection recently which is one of the things prompting this + I’ve got the urge to replay some of the games. I’ll be starting at the very beginning with the original Akalabeth on the Apple II. I’ve got more scans from Games Machine magazine today. 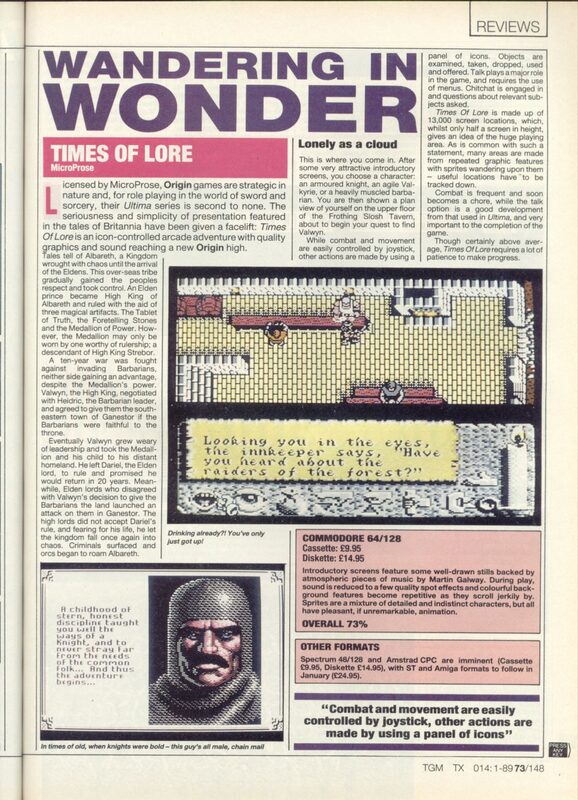 First up is Times Of Lore on the Commodore 64. It gets a middling sort of review. I’ve never played this version but I can imagine the C64 struggling to run the game so it was probably better suited to the PC. I’d give it around the same score myself having said that. It’s not a bad game as such but the most significant thing about it was the influence it had on the interface for future Ultima games. 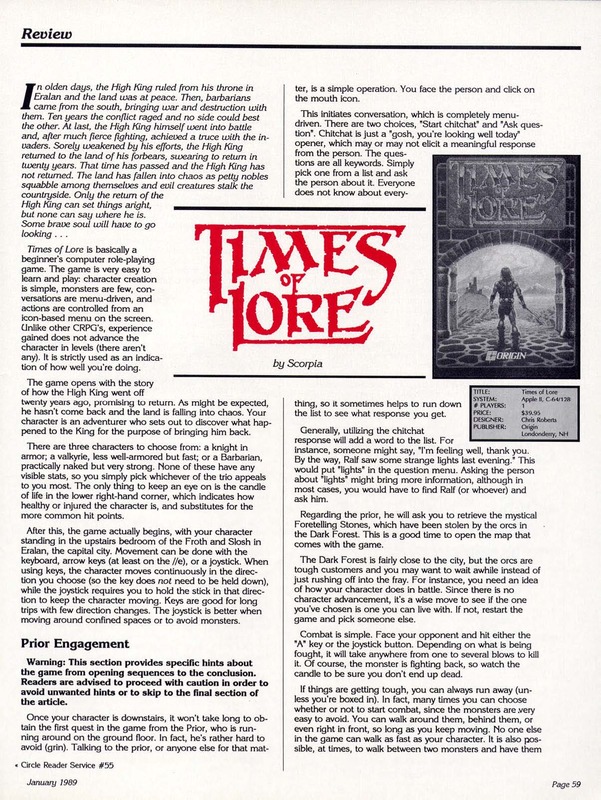 Times of Lore was Chris Roberts first game for Origin before he went on to create the hugely successful Wing Commander franchise. Its described as an action RPG although I’m not sure its really a true RPG. It was released on a whole string of systems but I’m sticking with DOS versions of all games where possible from now on. On loading the game the first thing thats noticeable is thats noticeable is that there is soundcard support for the first time in an Origin game. I get the feeling it was probably tacked on as an afterthought as its only available on the title screen and introduction (+ maybe the end sequence?). The title screen doesnt do much yet the music on it goes on for around 5-10 minutes – if this track was just looped in the game it would have helped the atmosphere a bit but maybe there were performance issues. The game only supports CMS and adlib so there is no MT-32 sound. 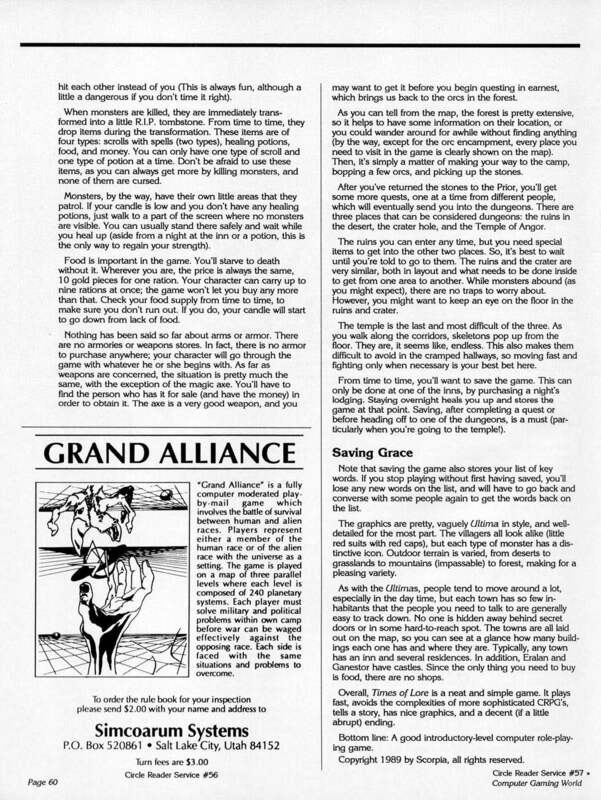 The games introduction is similar in style to Ultima 5 with small pictures and loads of text. Each screen of text has a unique bit of music for it. There really is a lot of music for this game considering you play most of it in silence. The plot is nothing special and basically boils down to the king and infant child going on a holiday and vanishing. You have to help find the 3 magic artifacts used to govern the kingdom and restore him to the throne. Since the king vanished, chaos has returned to the land (i.e. you will have to kill monsters). You have a choice of 3 characters. I can’t honestly say how they affect gameplay but I chose the knight. There are no character stats in the game, or levelling up unless they are hidden. I wouldn’t really call this an RPG without some stats, its more of an action adventure. Once I’ve chosen my character the game proper starts and the adlib sound stops. Despite the lack of sound first impressions here are pretty good. The engine is a huge step up from Ultima 5. Scrolling is now smooth, the roof pops off a building when you enter it. There is an isometic effect also on all the buildings. The game has mouse control although its fairly awful as it doesn’t use a pointer. Its easiest by far to stick to the keyboard. The icons at the bottom of the screen represent all the actions and correspond to the function keys. You use the cursors to walk about, return to attack and thats about all the keys you need. Again this is a huge improvement on Ultimas attempts to use every single key on the keyboard. I walk downstairs and get my first mission from an old man to find the seeing stones which were apparently stolen on the road to the north. Conversations use keywords but they are selected off a menu as you learn them. The conversations are much more limited than Ultima 5 but the system used is more advanced. I buy some food at the bar, chat to a couple of people and then head out north to find these stones. As soon as I get at of town I start getting attacked. Combat pretty much consists of walking up to the enemy and pressing return. Enemies usually die in 1 hit so its very quick. This is a good job as the number of monsters is fairly absurd. I bump into this woodcutter who tells me that the orcs have a camp up ahead – this seems a likely place to find the stones so I head there. After trailing through the bushes for 5 mins and killing a couple of dozen monsters I find the orc camp. A load of orcs set on me but they die off pretty quick. Monsters in this game when killed drop one item (usually). There are two colours of scrolls (freeze and kill all monsters) and two potions (restore some health, all health) + they can drop food and money. Regarding the scrolls and potions – they never drop one if you already hold the same one. Its usually best not to hold off using them for this reason as you get more chance to pick another up. One of the monsters drops an urn containing the stones so I pick it up and head back to the inn. Back at the inn I get a hint about a magic axe. Before I go any further I travel to the next town South to try to find it. It doesn’t take much seeking out and I buy it for 72 gold. This isn’t much considering how many bags of gold I’ve been picking up. Back at the tavern I give the urn to the old man and he sends me off to see the regent. The castle which had been locked up, is now open and surprise surprise the king gives me another quest. Aparently the tablet of truth is being held in another castle and I have to fetch it. A long trek across the length of the map later I get the right town. The castle is locked up but I ask around and get hints about a secret entrance. The entrance turns out to be in the pubs cellar. I head down the stairs, walk into a lever on the wall and head down again. The cellars aren’t too big so I find the tablet quickly enough, although I do have to avoid a load of guards on the way. When I take the tablet it talks to me, I ask about the high king and a message appears on it saying the king was assassinated and to look for the assassin in Lankwell. Lankwell is of course on the other side of the map, but I take a shortcut through the desert. I ask around and get put on the trail of the assassin who is called the Black Asp. He’s in a small hut just out of town – when I find him he gives me a signed confession to take to the guy I stole the tablet from so its another trek across the map. The warden isn’t too pleased to see me but as soon as I give him the scroll I get free access to the castle and he asks me to catch someone who has been spying at the castle. I ask around town and get told that a guard sneaks around every night, I wait around the castle until sunset, find and kill the guard, grab a note off the corpse then head back up to see the warden. He doesn’t seem all that interested and tells me instead of some plot by a load of dark clerics and how we must find the kings offspring. I’d be surprised if that doesn’t turn out to me in the end of the game but we’ll see. Via another side quest to rescue a child I get pointed in the direction of the royal wizard Irial. Before we get on with saving the kingdom Irial tells me to prove myself by killing a lyche in a ruined temple in the middle of desert. I have to get some holy water to kill it though which means another trek across the map. While I’m in the area I take a trip to Treela first to seek out some magic boots I’ve heard about. I buy these from the tavern. They do speed me up a bit so I can now run from battles. The number of monsters by now is just getting silly so this really helps. A monk sells me the holy water so its off to the temple to kill a lyche. The temple takes a bit of finding as its not really where it says it is on the games map but I get there in the end. This is by far the trickiest part of the game so far. The monsters are constant and the temple is maze like. I have to find and step on floor switches to open doors or teleport around. None of the monsters in here drop potions which makes life difficult. I took about 10 attempts to finish this. Since you can only save the game by sleeping at taverns this was a bit of a pain, having to walk back each time. I get the lyche in the end though. He just sits on the throne ignoring me so I use the holy water and he dies leaving behind a red potion which I grab. The next job is to go back to Irial and see where he sends me next. I’ve got a feeling there isn’t much of this game left – I seem to have been to nearly everywhere on the map already. I’m enjoying the game for all that – its pretty easy and simplistic but after Ultima 5 thats not a bad thing.